BrewDog, the Aberdeenshire-based craft brewer, is now worth more than 1bn after selling a stake to a US private equity firm. The brewer has raised 213m from TSG Consumer Partners, for a 22.3% stake. The deal will see about 100m paid out to the brewer’s co-founders, a further 100m go into the business and the rest used to buy shares from early investors. 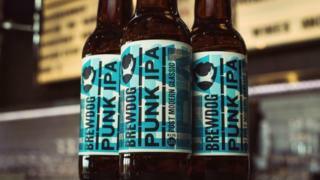 BrewDog earlier relied on crowdfunded cash and has 55,000 small investors. Founders James Watt and Martin Dickie had previously said they would never sell to a multinational beer maker, but Mr Watt told the BBC selling a minority stake to the US firm would “give us the fire power to compete globally”. Close to 13m will be available to smaller investors who responded to BrewDog’s earlier crowdfunding efforts. They will this week get the chance to sell shares, but can only sell up to 15% of their holdings, up to a maximum of 40 shares. Mr Watt rejected previous claims from the UK Crowdfunding Association that investment risks were not made clear to online investors. BrewDog grew rapidly from its founding in Fraserburgh in 2007, with a 20,000 bank loan, and opened its first pub in Aberdeen in 2010. It had revenues of 71m last year and returned a pre-tax profit of more than 7m. The private equity cash comes at a time of further expansion for the firm, which is building a new brewery in Columbus, Ohio, and hopes to launch in Australia and Asia after that. Despite global growth plans, Mr Watt said BrewDog remained committed to its Aberdeenshire headquarters. He said the brewer’s appeal to die-hard beer fans would not be diluted by “mainstream” financing or the company’s rapid growth. “Our appeal to drinkers isn’t about scale, it’s about passion and values. It’s about living or dying by what goes in to every glass or bottle,” he said.